There are times in life that will simply render you speechless. Your first visit to the rooftop amenities at Gallery Bethesda II is more than likely to be one of those instances. The panoramic views surrounding downtown Bethesda that greet you as you step out onto the terrace are enough to take your breath away. Perhaps an "OOH" or "AHH" may escape your lips without even realizing it. It's understandable. It isn't every day that you get the chance to experience such lifestyle splendor, unless you're lucky enough to call Gallery Bethesda II home. If you can bear to tear yourself away from gazing over the lush landscape, you'll find equally stunning scenery within each distinct space of the extensive rooftop amenities. And with the floor-to-ceiling glass throughout the space, you won't have to give up the open, airy feel of the outdoor terrace. Inside, you’ll find an elegant lounge, perfectly suited for year-round entertainment with chic decor and activities to match. 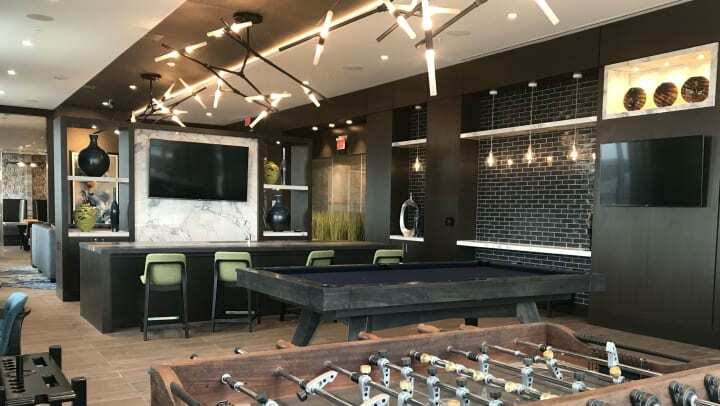 Challenge your friends and neighbors to a rousing night of billiards and foosball, while multiple TVs let you catch your favorite team in action. Or just chill and catch up with friends in the clubroom. Beyond your casual and spontaneous forays up to the roof, the space is an excellent fit for entertaining all sizes of groups. With a warming kitchen, dedicated pizza ovens, private dining room and meeting space, this elevated paradise is perfectly suited for casual get-togethers and celebrations of all types. Inevitably, you'll find the terrace beckoning you to savor more moments outside, just through a pair of glass doors. Dip your toes then slip effortlessly into our resort-class jetted-pool. Refresh with a spritz in the outdoor shower. Cozy yourself in comfy lounge seating by the outdoor fireplace with friends, or an enthralling book. And by all means, up your BBQ game at the top of the city at one of the grilling stations. It's all here for you. Embrace a higher level of living right now at Gallery at Bethesda II, and experience a rooftop space that will lead to a refreshed outlook on the heights of the good life. Schedule your private tour today to claim your place in the sky.